With the aim of building a long-term presence of cleft lip and palate treatment and rehabilitation in the community, we support the development of local, multi-disciplinary medical teams. Here, we profile one of our local partners! 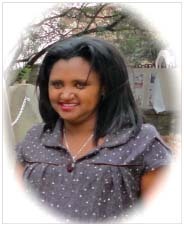 Hirut Mengistu, from Ethiopia, has worked at Yekatit 12 Hospital since 2007 as the assistance speech therapist. In 2011, she began to train as a social worker and now divides her time between social work and speech therapy. Since our last interview with her, Hirut has led 4 parent group discussions and has provided counselling to parents. She is in charge of intake at the project and she sees about 3-4 families per week as part of this process. We spoke to Hirut at the Congress, where she presented during Session #19 – Show & Tell: The Family. Children with cleft lip and palate sometimes drop out of school or isolate themselves. Hirut’s study focused on the psychosocial impact of cleft lip & palate on children aged 6 to 15 who attended Yekatit 12 Hospital. She hopes to engage with teachers and the wider community about cleft and hopes to spread more awareness. At the moment, however, she’s quite busy as there is currently a lack of speech therapists in Ethiopia. “We try to do a good job with what we have,” she says. To find out more about Hirut’s study, click here.